Kitamura wastes no time in DOWNRANGE. The tension in the film starts almost immediately and never lets up. I felt like I was holding my breath for 89 minutes, this film is utterly relentless. Six college-aged students are taking a cross-country trip when they have a blow out on one of their tires. In the middle of changing that tire, they happen across the shell casing from a long range rifle and realize, it wasn't a blowout. The tire had been shot. Within moments bullets are flying towards the young travelers and they are pinned down. Unable to move out from behind the vehicle, the elusive sniper unloads a barrage of fire. On an empty rural road, in the middle of nowhere, with inconsistent cell service, they are alone with this determined assassin. Their only hope seems to wait him out, to see if another car happens along their path. The marksman is frustratingly patient. He simply waits for them to move. Kitamura has adopted the less is more approach to his villain in DOWNRANGE. He understands that when you fill in the blanks, give too much backstory, and create empathy for the villain you lessen the tension. It might make for a more complex and nuanced story, but it kills the fun. 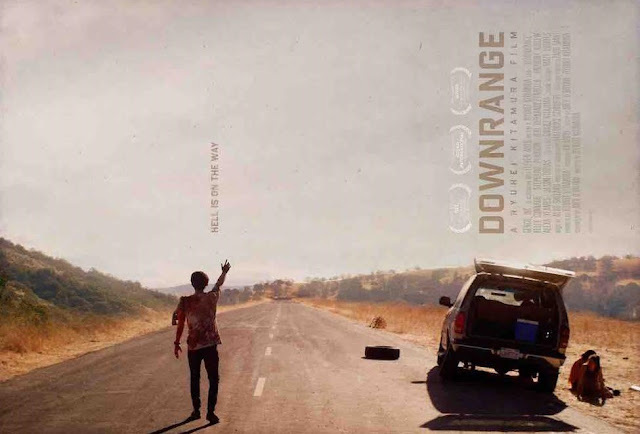 DOWNRANGE has a heightened sense of style that mirrors the frenetic story he is tackling. The camera is constantly moving and barely gives the audience a chance to get their bearings. Under the punishing heat of a blazing sun, the ensuing game of cat-and-mouse tests the resourcefulness of both sides, action escalating as new victims speed unsuspectingly into the line of fire. By nightfall what was once an unassuming stretch of isolated country road has become a smoking battlefield of wrecked cars, strewn corpses, hide-and-seek shootouts and everyone-for-themselves desperation. By sunrise? It’s only going to get worse..
To Americans, director Ryuhei Kitamura -- the man behind such cult hits as Versus, Azumi and The Midnight Meat Train -- may have worked with big names like Bradley Cooper and Luke Evans; and in the East, superstars like Shun Oguri and Tadanobu Asano, but he got his start in independent film, with he and his collaborators fighting against all odds to craft large-scale excitement with next to no money or resources.